It’s July, and it’s HOT - there’s just no other way to describe it. Air conditioners all across the country are turned to high. So what to do if you have valuable items, equipment or even employees in the field that need to stay cool? Storage sheds or outdoor tents just don’t provide the protection, security, and most off all cool comfort that’s required. Choosing a climate controlled shipping container will help keep the heat outside where it belongs. A climate controlled container keeps your valuables at a safe temperature and ensures it’s bearable when it’s time to access those items. Shipping containers are definitely safe, secure and convenient – but they’re also hot in the summer. They’re constructed of Corten steel with no ventilation unless modified, and without climate control, that heat could damage sensitive items. 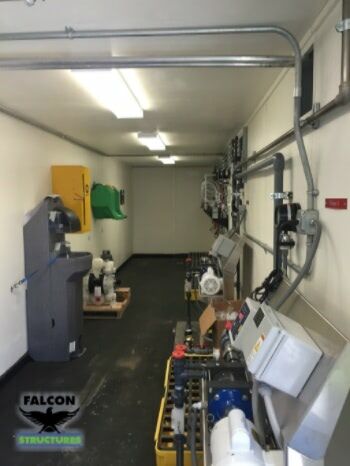 The Falcon Climate Controlled Conex container is insulated and outfitted with an AC unit controlled by a thermostat located right inside the doors. You won’t have to crawl over your stuff to turn on or off the AC unit! 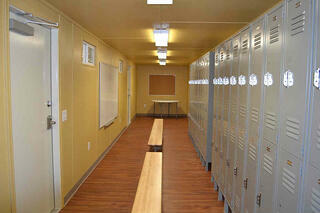 Your container can even have a personnel door for easy access, or shelving to stay organized. Shipping containers are inherently secure. They are the perfect solution for storing equipment that is vulnerable to theft. But some equipment must stay at a consistent temperature to remain effective in the field. Several grades of insulation along with multiple HVAC systems to choose from, ensures that your container is reliably climate controlled anywhere you choose to place it. Did we mention it’s hot? Your employees working outdoors think so too. Keep productivity and morale high by providing a climate controlled break room for those that mean the most to your business. At Falcon, our employee 40ft container break room includes a small kitchenette, a bathroom complete with shower, and a seating area to take refuge from the Texas heat. Consider adding lockers to keep employee belongings safe while on the job site. Whether you’ve outgrown your existing facility and require additional office space, or you have employees working in remote or field locations, temperature control is important for any workspace. Climate control comes standard on all Falcon field offices but can be upgraded for any number of environmental conditions. Your employees will thank you. 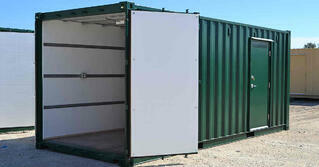 Climate controlled shipping containers provide a safe, secure and most of all comfortable place to store, work or live. With many options to choose from, you’re sure to find a temperature controlled solution to fit any need. If you want to store, work or live in comfort this summer, contact a Falcon representative to discuss the right solution for you. Give us a call at 877-704-0177.